Forty percent of Hungarians believe that there is a realistic chance at booting the ruling Fidesz party from power in the spring 2018 elections, while 37% believe that there is no chance of this whatsoever–this, according to a new poll released by Závecz Research. The poll also found that 43% of respondents would prefer a new government next year, while around one third of Hungarians (32%) would rather have Prime Minister Viktor Orbán’s party retain power for another four years. These are the only number in the Závecz Research poll that may give the opposition some solace, along with perhaps the fact that 37% of respondents currently claim to have no party preference and are undecided. (Whether it is even possible to mobilise this group and what percentage of respondents are deliberately withholding their preferences from pollsters is a different matter.) The rest of the results, however, suggest that Fidesz has extended its poll lead slightly and just like it has for most of the past seven years, the opposition continues to stagnate. Since such a large proportion of respondents claim to have no party preference, it is best to look at numbers that examine the entire population, not just decided voters. 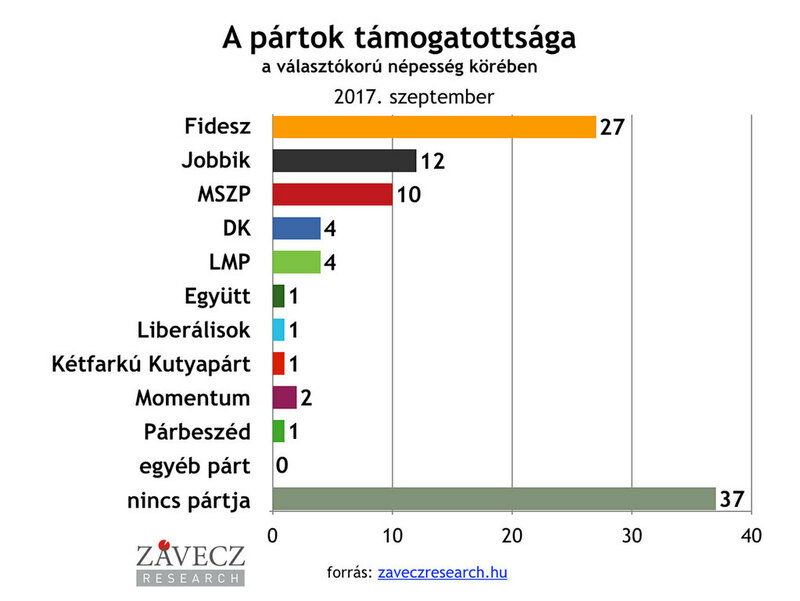 In this category, Fidesz support stands at 27%, with Jobbik in second place at 12%, the Hungarian Socialist Party (MSZP) at 10%, the Democratic Coalition and Politics Can Be Different (LMP) both at 4%. Momentum stands at 2%. There are then a handful of tiny parties all at 1%, including Együtt, the Liberals, the satirical Two-Tailed Dog Party and Párbeszéd. Among decided voters, Fidesz stands at 44%, followed by Jobbik at 19% and MSZP at 17%. In this category, the Democratic Coalition stands the best chance of passing the minimum 5% threshold required for parliamentary representation. The party garners 8% of the vote and also has the most committed base of voters of any party. Fully 62% of DK supporters plan to cast a ballot. That compares to just 53% for MSZP, 51% for Fidesz and 49% for Jobbik. If we look at the distribution of decided voters, it appears that Fidesz, Jobbik, MSZP and DK are the only parties that would pass the minimum threshold and enter parliament. LMP is close with 4%, but their problem lies in the fact that their voters are the least motivated, with just 35% certain that they would actually cast a ballot. Overall, Fidesz has seen a small increase in support (1% among all voters), while Jobbik’s popularity dropped by 1%. MSZP experienced a drop in support this past summer, but its numbers have now stabilized and are unchanged. DK continues to stagnate as well. Only LMP and Momentum saw increases in their popularity of 1% each. Unless there is a significant number of respondents who are consciously misleading pollsters or withholding their true intentions for fear of political retribution, none of these numbers suggest that the opposition is any closer to giving Fidesz a run for its money next year. Well, is there anything Hungarians would not believe? Could lose is not same as will lose. As long as the economy is improving, that likely will not happen. Even personal scandals seldom cause government to lose power.Just remember Nixon’s and Clinton’s scandals? Both got re-elected right in the middle of the scandals. But I would never say “never”. Time will tell. We’ll see, just as the blind man said. But do not hold your breath ! In 2002, polls had Fidesz winning re-election, but to everyone’s surprise MSZP and SZDSZ together secured a slim, but workable parliamentary majority. The polls were off by around 5-6%. This time, the polls would have to be much more inaccurate for the opposition to get a surprise win. As well, in 2002, the decks were not stacked against the opposition, as they are today, nor was the opposition anywhere as fragmented as it is now. Sad to say, but the opposition has probably missed the train on 2018. I can’t see any scenario where they find and build up an acceptable, charismatic, unifying candidate, or where a surprise candidate shows up and shakes everything up (a la Macron) in the six months that remain before Hungarians go the polls. Since in Hungary the idea of the democratic clear majority is an unknown idea, an election can be really manipulated by a political deal any way one have the influence to do it. No one need to win, just work out a deal, even with the devil. The masses will buy it anyway. That is what the so called “coalition-government” and the present “election laws” guarantee. That’s good for Hungarians. Or just about anything. Hm? The “Marcon” case turned out to be unique. Holland was a total disaster, LaPen had a fascist background. Just about any one could have made it then in that situation. So a clean-cut young fellow just walked into the presidential palace. That really does not seem to be the case in Hungary. There is just a fragmented country, and no leadership at all. Did the poll only survey Soros supporters, probably. Fake News!!!!! 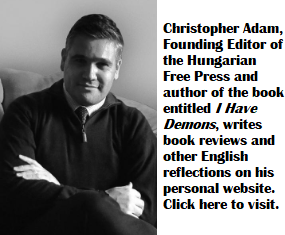 Is your comment a type of self-effacing parody of Fidesz supporters?